Here is my newest quilt. Finished, binding and all. 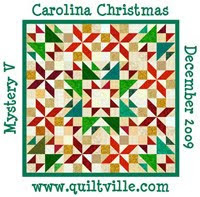 I say that, because I have a king size that I quilted a year ago and still doesn't have the binding on it. This is a scrappy trip around the world. 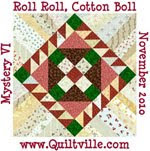 The pattern is free from Bonnie Hunter at http://www.quiltville.com/ Of course the Kilroy holding the quilt is my dear husband. 4 weeks until he shaves and has a haircut. He retired last year, from the military, and said he was growing it for a year. 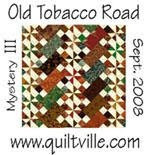 I do love this quilt and may have to make another one. I still have bunches of 2 1/2 strips. On another subject. DH made 2 blue bird boxes this morning and Mrs Blue Bird moved in by 3pm this afternoon, building her nest. Our old box was knocked down and broken in a wind storm. Very sad, because my Mom had made it. But the new birds make up for that. That is beautiful. Love the binding & the colors are so gorgeous. Great job! beautiful quilt. my mom has a quilt with an unfinished binding, it has been that way for nearly 50 years. it keeps some people from claiming it as theirs. I made one in February, but I like yours a lot more...much more colourful and energetic! I may have to make another one too!